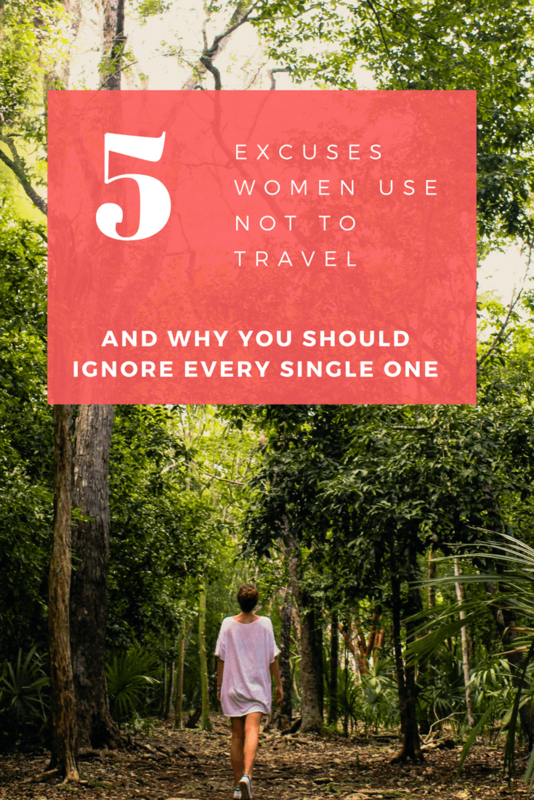 Today we have a special guest post on excuses women use not to travel written by Phoebe from The Chance of Choice. A few years ago, Phoebe was diagnosed with illnesses that doctors claimed she’d never recover from. Today, she is healthy, happy and on her way to visiting every country in the world. She knows firsthand the value of setting aside excuses and following your dreams. 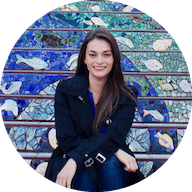 Here’s her advice for pushing aside those limiting thoughts! If a Spanish teacher in San Pedro, Guatemala who earns 80p ($1) an hour can save for travel, there must be areas of your life you can reassess. When you make changes to save for traveling you expect to feel like you’re missing out on things. But you are saving for something even bigger and better. If you get a coffee each day, buy lunch, eat out regularly, get waxed, get your hair done or have a gym membership, good news! These things are all disposable so there is no need to use the “I can’t afford it” excuse–you can cut back and start saving today. There is one prying questions behind this excuse. Are you waiting for them to travel with you? If you are waiting for them to travel with you, just like waiting for friends, you may end up waiting forever. Spending your time hoping will end up in resentment and regret. Resolve to travel alone. After moving past the disappointment of not being able to travel with the one you love, you’ll find empowerment and relief. If your partner wants to help you improve and be the best version of yourself, they’ll encourage all your interests, including travel. Travel isn’t dangerous in and of itself; it’s the situations or areas that may increase the amount of danger you’re exposed to. As one solo female traveler said,”I don’t feel any less safe here than I do in London, there are parts of London I wouldn’t walk around in the dark in.” There are areas in every country you shouldn’t go to past dark, clad with valuables or alone. Be sensible in your decision-making and keep your belongings as safe as possible. The dangers in the statement of “it’s too dangerous” can be mitigated, just like they can be when you are at home. Are you not going to go on a once-in-a-lifetime, unforgettable trip because you’re scared of something that could just as easily happen where you live? Statistics are saying that for people of Generation Y and Z (Gen Y: 1981—1997, Gen Z:1995 or later) will on average be living until 90 or so, with many exceeding the age of 100. Looking back at the national retirement ages, that means we will probably be working until we are 72-77 depending on the country, government and everyone’s individual financial situation. As a 20-something will you look back during retirement and think, “If only I had spent that year working and really developing my career, that was such a mistake?” Probably not. 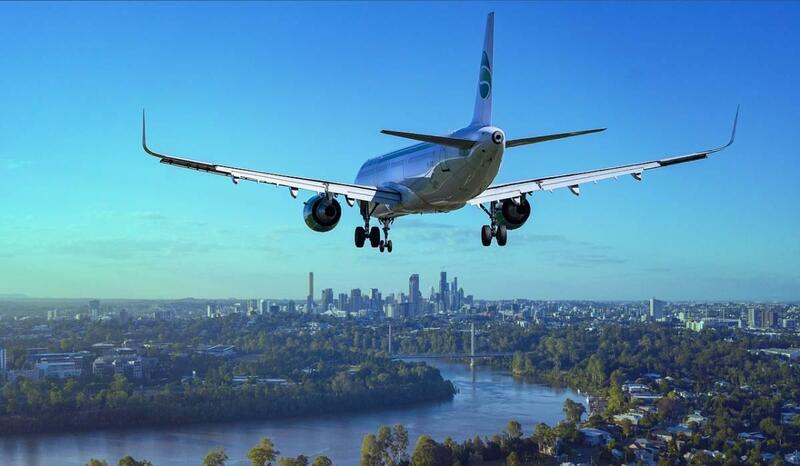 Many people do not have the option to travel, do if you do, take advantage. It’s a privilege that could be taken away from you in a second, whether it be related to health, family or finance. You may have heard any one of the following: That’s way too dangerous. What about your career? What about your family? These sentiments come from a group that has been coined “well-wishing haters.” These are the ones that want what’s best for you, but unintentionally say things that knock you down and make you question your decisions. They care and want to protect you, but without realizing their comments can prevent you from doing something that will bring you growth and fulfillment. The best thing you can do is what’s right for you. This is a great post! I totally agree with all these statements. 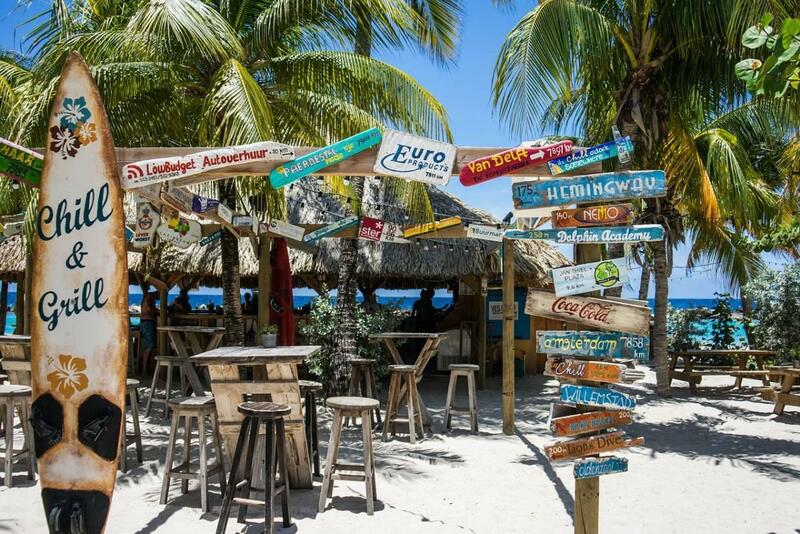 Travel can be sooo affordable depending on the way you approach it and where you go. 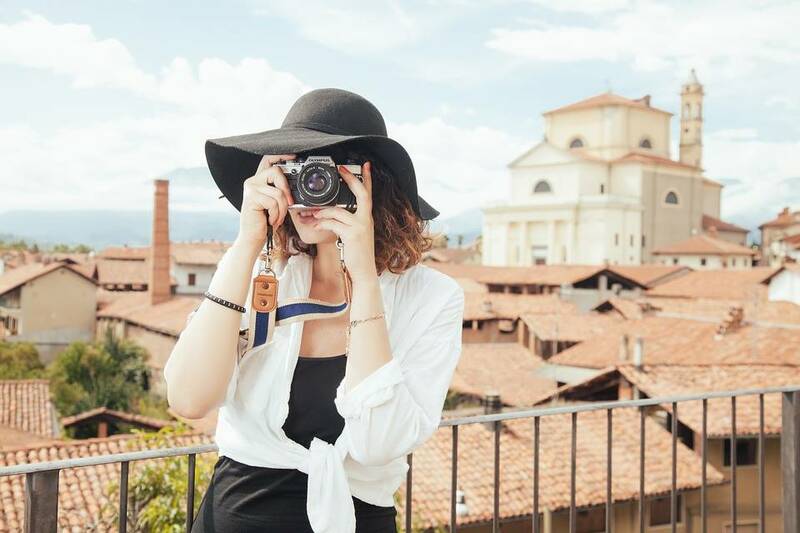 If you head to some developing countries and consider options like work trades or couch surfing, you can keep your daily budget super low or travel longer. All of these are great points! Number 5… I always say, we’re all gonna die anyway, why work so hard for money that you’re going to bring to your grave? Might as well live and travel! And number 3 just sounds like a sad excuse from lazy girls! It’s true that we can always come up with a million excuses to prevent us from doing anything! This is a good reminder to just get out there and do it. I don’t you will ever regret making a travel decision! Thanks for the reminder! Amen! Women should never let fear hold them back from seeing the world. I personally love to travel solo and refuse to let fear stop me. The only item on Phoebe’s list that did stop me was Boyfriend/Husband back home. That’s trickier. My husband never minded me taking trips without him, but we’re divorced now. There’s got to be the right balance when another person in a relationship needs to be considered. Loved seeing this post. These are all reasons that we use not to travel, and as you point out, each reason can be overcome if a person really wants to make it happen. One key point about relationships and values — if travel is important to you, then you need to keep that in mind as you choose a life partner. If it’s not something both of you value, it can be a very destructive issue in a relationship — it was part of my first divorce. Time waits for no one and we should not make excuses for not travelling! We should see the world as much as possible. 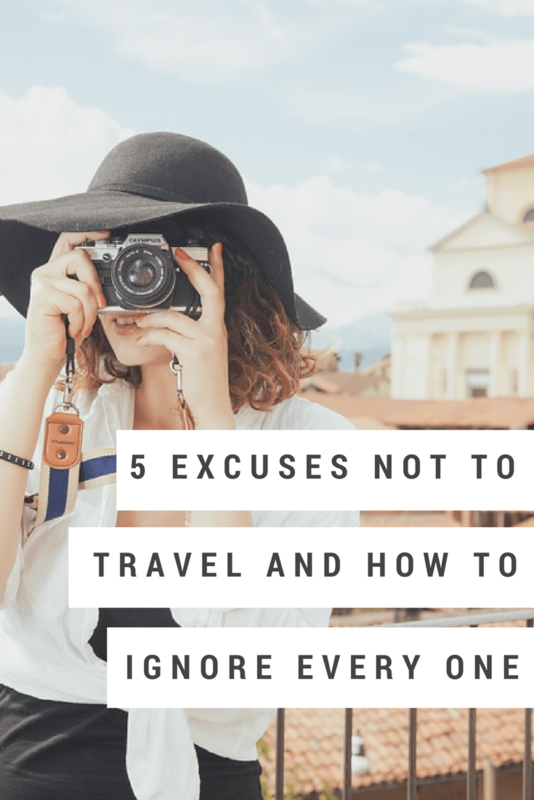 I agreed that not having anyone traveling with you is not an excuse! If you want to see the world, you will make it happen no matter what. I remember in university, I would travel on my own, or join a tour group and meet new people that way! All those and many other excuses I hear on daily basis from people. They even use them sometimes for making me stop traveling.